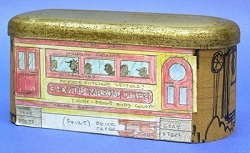 Note from Editor - More Tribute to Tinplate! This is a unique project that Howard thought up when he came across an old glasses case and realized it would make a good roof for some sort of tinplate structure. But what kind? Well, considering it was almost the size and shape of the roof of the Marx passenger cars Howard recently acquired, the project almost suggested itself. 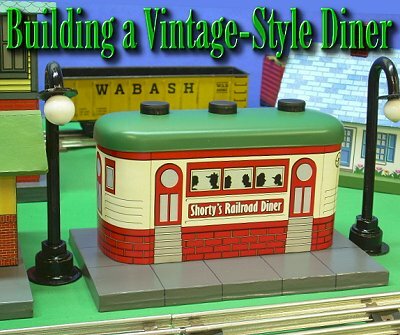 Until I started researching this project, I thought that all of those old railroad-car-style diners I've seen over the years were built out of actual railroad cars. It turns out that relatively few ever saw life on the rails. But the railroad dining cars, with their bench seating and single long aisle turned out to be a good "prototype" for any restaurant owner whose business plan depended on getting people in, served, and out quickly. 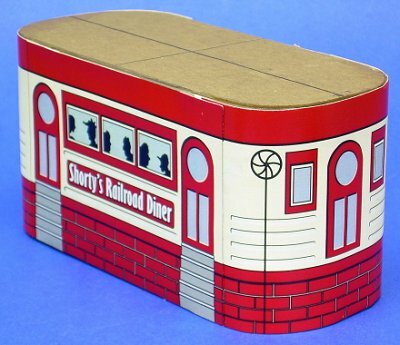 So diners that looked like railroad cars appeared all over the country within a few years of the first business successes. When I showed Paul one of my "mockups" for this project, he offered to push some other projects aside and make the graphic for this project. He and I exchanged dimensions and test files several times until we found a combination that looked right with the glasses case I started with. If you have a glasses case you can use, chances are the measurements will be a bit different, but there is a lot of "give" in the patterns, so you'll proably just need to experiment. The drawing to the right shows one of the drawings I sent to Paul to help him figure out exactly how big each portion of the graphic should be. We're including it in this article because it shows helpful details of the construction. If you click on the the drawing, you'll get a bigger version. 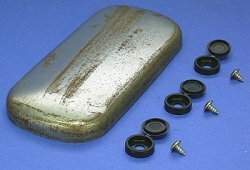 For a metal roof, find an old eye-glasses case that is symmetrical and that nobody will mind you disassembling. If you can't come across such an item, you can always make the roof from a block of wood, and sand down the corners with a belt sander to give that smooth look. In fact, if you're building this project in a much larger or much smaller scale, you'll pretty well have to use a wood roof. For the roof vents, I used plastic screw caps from hardware store held on with sheet metal screws. 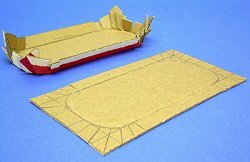 For the diner body, I used clean solid cardboard, such as from cereal boxes or the backs of writing tablet. Clear indoor-outdoor acrylic spray to add a metallic appearance to the final product. Update for 2014 Howard Lamey has figured out how to build this structure using a Nestles container. If you would rather try that method, click on the picture to the right. The same graphics will work on either project, so you have a choice of year-round ("Shorty's), Halloween, or Christmas ("Donner's"). Because my Marx tinplate trains are smaller than they would be if they were actually built to scale, Paul has calculated the door heights, etc. for this project as closer to S scale. This size looks good, not only with old toy trains, but also with Christmas villages, so it will be the favorite size with folks who try this project. The plans are also in S scale. 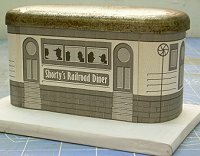 But in case you want to build a true O scale structure or you want to build a diner large enough to go with Large Scale or Standard Gauge trains, Paul has also provided graphics for those sizes as well. You WILL have to adjust the sizes shown on the plans if you choose one of the larger scales. But then again, it's likely you'll have to do some adjusting anyway. 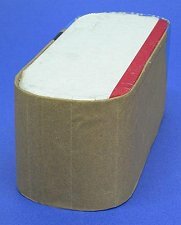 The ultimate size of your project depends on the size of the eye-glasses case you are using as a roof. If you're making the roof from wood, of course, you have total control over the size. The eye-glasses case I used came coated with vinyl. I used a needlenosed pliers to pull the hinge pin out of the hinge. Then I nipped the hinge off as cleanly as I could and peeled away the vinyl covering and the liner. This allowed me to use the "roof" to get the rest of my measurements. In the photo above right, you can see the plastic screw caps I used to represent roof vents. You'll probably think of something you like just as much, but there they are. Eventually, I cleaned off the roof, primed it with a light coat of rust primer, finished it with green spray paint, and installed the vents. However, as you'll see further down, I didn't do that until I had the rest of the diner ready to go - that way I didn't have to worry about scratching the paint job while I was using the roof to doublecheck the size of things, etc. 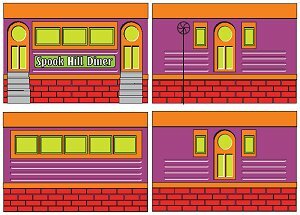 This project has outline patterns based on the dimensions of my original project, plus graphic files you can use to complete the appearance of the diner. Printing the Plans - You may use cheap copy paper for the plans since you're only using them to transfer the patterns to your cardboard. If you have Adobe Acrobat Reader on your computer, click on each drawing above to get a full-sized pdf version that you can print. When you print, you may have to select "auto rotate and center" or something similar to get some of the drawings to print out right, but make certain that they print at 100% size. Keep in mind that the ultimate "footprint" of your diner depends on the size of eye-glasses case you started with, so these plans are "suggestions." Printing the Graphics - We've provided three versions to help you print the "lithograph" graphics at the size you need. Each sheet should be printed on acid-free high-grade paper or card stock. Note: Consider printing this sheet in black and white first to double-check the size against your existing equipment and/or the eye-glasses case you are using. As Shown - For use with S Scale or O-gauge tinplate trains (such as Marx tinplate and smaller O27 trains), download the S Scale Ends and Sides graphic. O Scale (Larger) - For use with true O scale model trains, download the O Scale Ends and Sides graphic. Also, if you want an HO scale structure, download this file and print it at 50%. 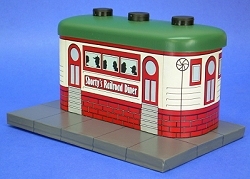 Note about Other Sizes: If you want an HO building, try downloading the O scale graphics, then printing at 50%. If you need the lithographed-style graphics for any other scales, contact Paul. The base is a rectangular "box" built up from corrugated cardboard. The foundation will be covered once the building is fastened together, so it may be a single piece of thick corrogated cardboard or a piece of foam core board (shown). After you have built the base, cut the foundation piece out, using the "top and bottom" plan for size and shape, and set it loosely on the base. Position your building over it to make certain it is a secure, but not overly tight fit. 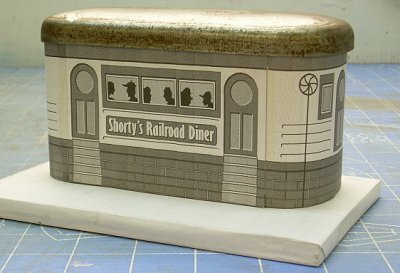 When you're finally certain that the diner will fit on the base properly, prime the base and paint it with several coats of glossy paint in the color of your choice. Industrial gray was the color most often chosen for this kind of structure in the tinplate days. For this project, I also "graphed out" squares to represent sidewalk lines and drew them in with a fine black ball-point pen. Although this structure takes its overall shape from the shape of the roof, it also needs internal reinforcement to keep its shape. The photo to the right shows the top and bottom that will actually sit "inside" the body of the diner. The little tabs fold up (or down) into the diner walls to help them keep their shape. When you cut and fold these, test to make certain that they will fit INSIDE the roof dimension, even after you've added the additional thickness of the walls. Also, remember that the bottom piece sits up a bit to make room for the foundation. Please refer to the sketch above for an idea of how the walls go together. Also, the diner cross section diagram shows the relative position of the bracing inside the walls. As mentioned before, I did several mockups before I decided on the final dimensions, so you'll want to test at each step of the way to avoid having to do a bunch of work twice. Note about Height: While you're doing your mockups, think about the height of the structure. Paul gave me extra "steps" and an extra row of bricks on the bottom so I could wap the graphic around the bottom without any white showing. Then I forgot that was what the extra row was for and incorporated them into the structure. As a result, Paul thinks that my diner sits just a tad higher than it should. Set your mockup near other structures on your railroad to decide how tall you think it should be before you start gluing walls together for "good." Remember, this is YOUR structure, and the person you have to satisfy with this project is you. I cut out the side walls and wrapped them around the internal top and bottom bracing. I checked THAT against the roof piece (not shown) before I glued it all together. Before you start gluing the graphics on, do one more "mockup," using scotch tape to put the graphics where you think they should go. This is your final chance to check the fit. Apply the printed graphics. Only do a section at a time. I like to start with the ends. As you can see, there aren't exactly any corners, so you have to get the doors on the end as well as you can, and work your way around. Then when you place the walls, use the "fluting" pattern on the end to get the walls as centered as possible. After the graphic sheets have dried in place, you will see white edges where the paper cut runs through the red strips. With a red felt-tip pen or marker or with acrylic paint and a very tiny brush, carefully coat just the edge of the paper or card stock to camouflage the edges. Once the glue is dry on all of the graphics, it is relatively simple to glue the structure solidly together. That said, you may want to check on it every so often to make certain that something doesn't shift out of place while it is drying. Wait until all of the glue is thoroughly dry (usually at least overnight), then spray the building with several light coats of a clear glossy indoor/outdoor acrylic finish. This protects it somewhat from moisture and dust. It also helps reduce fading and makes the lithography pattern "pop." Do not such a heavy coat in one pass that you cause any streaks, runs, or drips, though, or you'll have to start over. This usually looks good near a depot, somewhere where people waiting for or coming off a train might nip in for a cup of hot coffee. If you like this project, stay in touch - more are on the way. In the meantime, you might like to take a look at the following bonus graphic, as well as a long list of projects that would look good next to this one. 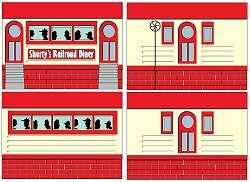 Bonus for 2010: Halloween Graphics - As an extra halloween gift to our readers, we're including a set of S Scale Halloween Diner graphics you may use to produce a seasonally creepy version of this project for your Halloween-themed village or railroad. 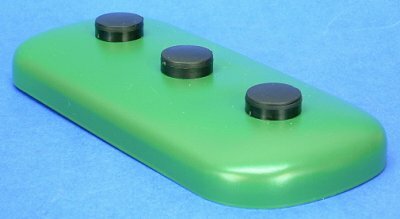 For now, we're just providing the size of the project shown above (for use with S Scale or O-gauge tinplate trains or resin/ceramicvillages). If you need another size, contact Paul. 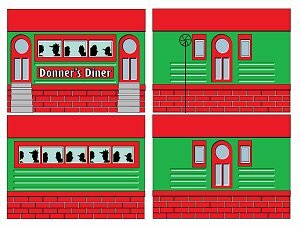 Bonus: Christmas Graphics - As an extra holiday gift to our readers, we're including a set of S Scale Christmas Diner graphics you may use to produce an especially "festive" version of this project for your holiday decorating. For now, we're just providing the size of the project shown above (for use with S Scale or O-gauge tinplate trains or resin/ceramic villages). But the GOOD news is that I have heard that a particular Nestle's Quick can fits the graphic precisely. If you need another size, contact Paul. More "Tribute to Tinplate" Articles Here's a series of projects that pay "Tribute to Tinplate," based on the tinplated-steel trains and towns of a century ago. Free downloadable commercial-grade graphics and instructions will help you inexpensively add an authentic vintage look to any indoor railroad. Most projects have multiple pre-scaled plans and graphics, plus scalable graphics for the smaller scales, so you can easily add a vintage look to ANY railroad or holiday village, no matter what size your trains and towns are. We have more on the drawing board, so be sure and check back.